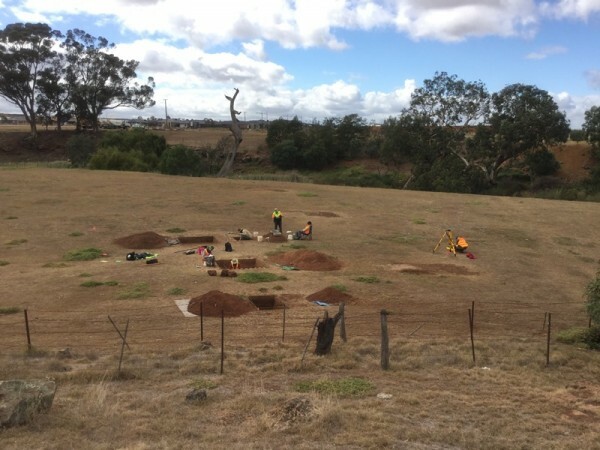 The construction of a new bridge across Toolern Creek, south of Melton, triggered a series of archaeological investigations on the banks of this waterway. The study focused especially on a large cultural deposit that extends across the wide flat to the west of the creek. Initially 178 stone artefacts made from silcrete, quartz and quartzite material were recorded. Subsequent excavations gathered a much larger number of artefacts, and yielded information on the site’s geomorphology. Charcoal was collected for radiocarbon analysis to provide absolute dates on the excavated deposits. This information, combined with the study of contexts and artefacts, enable reconstruction of the site’s long-term occupation history. The archaeological investigation at Toolern Creek Bridge is part of the larger, ongoing Atherstone development project, which you can read more about here. Scibilia, J. and H. Kiddell. 2014. Atherstone Bridge Construction Bridge Road, Melton South. CHMP 12408, Report to Lend Lease Communities (Atherstone). Scibilia, J. In prep. Atherstone Bridge Construction, Archaeological Salvage Program of VAHR Places. Report to Lend Lease Communities (Atherstone).